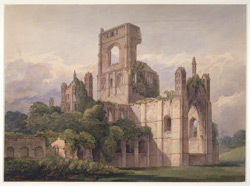 Abbot Alexander founded Kirkstall Abbey beside the River Aire in 1152. Building of the church began in that year and by 1159, although not complete, it was ready to receive its first inhabitants.By the time of Alexander's death in 1182, the monastery contained all the required buildings - the oratory, dormitory, guest houses, cloister and refectory. It also contained numerous craft-shops where the monks produced leather goods, leadwork, textiles and metalwork. On 22 November 1539, Abbot John Ripley and his 31 monks surrendered Kirkstall to Richard Leyton, one of Henry VIII's commissioners in the enforced closures of monastic establishments. To ensure the monks did not try to return, the roofs, windows and furnishings were ripped out and the main road to Leeds was re-routed through the nave and east window.